On a freezing night in January, the body of a woman was found in an alleyway outside a Kirkland church where a local agency housed one of its roving emergency shelters. The shelter wasn’t open at that time. Employees with the agency, The Sophia Way, think the woman may have come to the site thinking that the shelter was open before she died of hypothermia. Some recognized her, but haven’t been able to confirm her last name. She remains unidentified. That incident made clear the need for a permanent shelter in the area, said Linda Benson, director of community development for The Sophia Way, which helps women experiencing homelessness in King County. This week, local civic and agency leaders broke ground on a new shelter in Kirkland for women and families who are experiencing homelessness. The shelter, located at Northeast 80th Street and 120th Avenue Northeast, is expected to open by mid-2020. The building will be the first 24-hour permanent site for adult women and families on the Eastside, which has a rising homeless population that advocates say could grow if the issue isn’t more widely addressed. 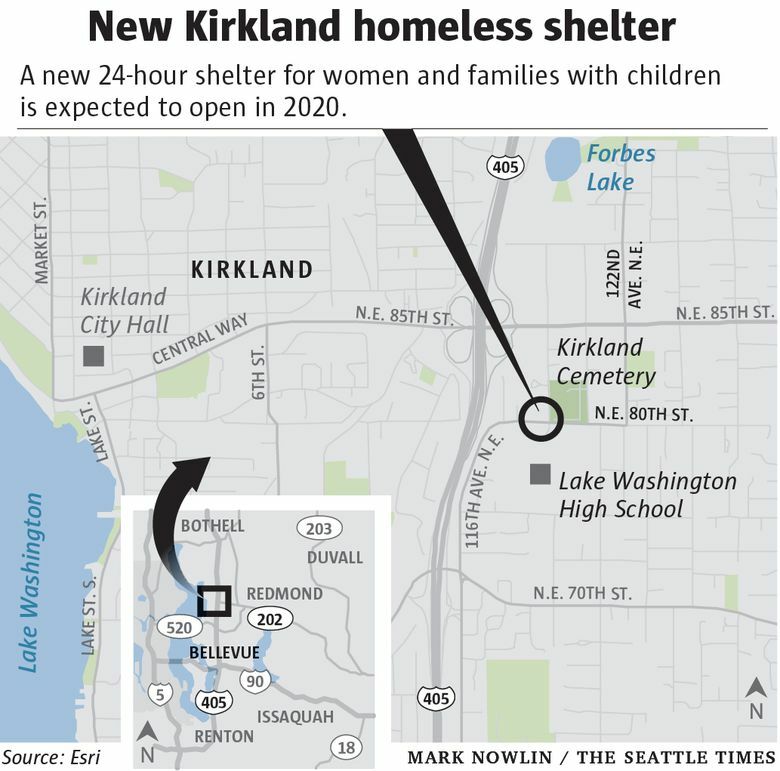 Kirkland is one of three Eastside cities — along with Redmond and Bellevue — where leaders have come up with a plan to build more shelter beds outside Seattle and spread services for different demographics. Redmond opened a year-round youth shelter. Bellevue continues to work toward opening a year-round shelter for men. “The whole vision was for the major cities to step up and own a piece of the crisis” when the cities agreed on the plan in 2012, Benson said. Kirkland started working on plans for a permanent facility in 2016 and purchased the property from Salt House Church in 2018. The Kirkland shelter will have two levels, with services for women on one floor — operated by The Sophia Way — and families with children on the other floor, run by New Bethlehem Project, a program of Catholic Community Services. With a total of 100 beds, the women will have singular cubicles in a communal space and the families will have private spaces. The people staying there won’t have to leave during the day, and will have access to showers, laundry and meals. Other existing shelters offer these services, but none in a permanent, 24-hour location. The Sophia Way, for example, operates an emergency shelter that will remain open until the new one is completed, but it has to move between churches every few weeks or months, and women must sleep on mats on the floor. Another organization called LifeWire operates a shelter on the Eastside, but primarily serves women who are experiencing domestic violence. New Bethlehem Project runs a day center in Kirkland, but it closes at 8 p.m.
Those organizations have seen more families staying in overnight shelters and living in their cars for the rest of the time, said Amber North, program manager for New Bethlehem Project. About 800 students in Eastside public schools are homeless, according to Washington state education data. The majority of those students reported their families staying with relatives or families, but a small percentage said they were living unsheltered. The shelter will be funded by the city of Kirkland, King County, Washington state, A Regional Coalition for Housing (ARCH) and private donors, including Holy Family Church, St. Louise Church and The Sophia Way donors. Benson said that the shelter will likely fill up fast — emphasizing the continued need for community support for those on the verge of or already experiencing homelessness.